Abandoned Luncheonette is the second studio album by the American pop rock duo Hall & Oates, released in 1973, which combines folk, Philly soul, and acoustic soul. It is the most commercially successful of their first three albums of the duo's Atlantic Records period; the album reached #33 on the Billboard Top LPs & Tapes chart. Twenty-nine years after its release, the album was certified platinum (over one million copies sold) by the Recording Industry Association of America. It is the duo's favorite Hall & Oates album. After their first album, Whole Oats failed to make an impact the duo moved from Philadelphia to New York and started recording Abandoned Luncheonette, it became the first album they recorded as New Yorkers. Recording that album was where we learned how songs become records. Our producer, the legendary Arif Mardin carefully crafted each song, every bit of nuance, bringing in the perfect players for the right moments. And it all worked together as one beautiful musical tapestry. —  John Oates in an interview with Chris Epting. Their producer was still Arif Mardin but they wanted to get away from the commercial standards to establish the parameters of their musical identity, and Arif helped in this regard. He liked the American musical influence that Hall & Oates had been brought up on and he knew just how to bring all their ideas to life, adding much of his own vision. When Daryl and John began producing themselves in the early 80s, they thought back to everything they learned from watching Arif. Unlike later albums, this one contains a relatively even songwriting split with both partners contributing a handful of their own songs, while still making room for a few co-writes. Synthesizers were included as part of the records to obtain what the duo wanted on the album. Initially, the album wasn't very successful in the US, but it received significant airplay on a local Minneapolis-St. Paul FM radio station, KQRS, resulting in it being a hit in that area. The duo were happy that they became popular on the college circuit and that underground radio embraced the album, and they began touring all over the country, playing in a large variety of venues: backwoods towns, big cities, colleges, clubs and auditoriums. —  John Oates excerpt from an interview for Ultimate Classic Rock. After She's Gone was re-released in 1976 and became a hit, the album peaked at #33 on the Billboard 200, but by that time the duo had left Atlantic Records and moved to RCA Records, where they would become one of the biggest acts of the 1980s. Stephen Thomas Erlewine, from Allmusic, gave the album five stars, calling it "the first indication of the duo's talent for sleek, soul-inflected pop/rock". On December 13, 2002 it was certified platinum by the RIAA. The most well-known track from the album is "She's Gone". While the tune did not become a hit when first released as a single (it only peaked at #60 on the U.S Billboard Hot 100), the song gained momentum from two later covers, one by Lou Rawls, and one by Tavares. After the latter cover topped the Billboard R&B chart in 1974, the original was re-released and became a Top 10 pop hit in 1976, reaching #7 in the U.S, while the album reached #33 on the Billboard Top LPs & Tapes chart. The single version was included on the album Rock and Soul Part 1 while the album version is included in numerous other compilations such as The Singles (2008), The Essential (2005), Looking Back: The Best of (1991) but the song is missing on the albums The Very Best of Daryl Hall & John Oates (2001) and Playlist: The Very Best of Daryl Hall & John Oates (2008) although it's one of Hall & Oates' favorite songs. Another song from the album, "Las Vegas Turnaround (The Stewardess Song)," although written by Oates, draws its inspiration from Hall's then-girlfriend and future songwriting collaborator Sara Allen, much as the later "Sara Smile" would. The images were shot by a young fine artist photographer named Barbara Wilson. She had originally met Oates in the late 60s while they were both in college, and over the years became friendly with Daryl as well. On a warm summer day, once the album was finished, Wilson, her husband, Hall and Oates drove from New York city to the rural spot on the road about 40 miles outside of Philadelphia. The group arranged permission to take photos of the old restaurant but they thought that the session was incomplete without getting inside. And so they snuck in and Wilson started shooting, carefully tip-toeing around broken glass and tile. The guys squeezed into a booth and the rest is album cover history (the interior was used as the back cover). The owner began screaming at them when he realized where they were, and they quickly left. Wilson shot the black-and-white 35mm images on an old Nikon SLR and then began a silkscreen process to create the surreal color imagery, using a different stencil for each hue and then hand-coloring the final piece. Atlantic Records bought the idea with one change, to re-do the neon tubing letters, which had all been done by hand. It was the only album cover Wilson ever did. She had also spent a day in the Atlantic studios while the album was being recorded and managed to capture a series of intimate images of the two. Recording and Engineering – Alan Ade, Jimmy Douglass, Lewis Hahn, Joel Kerr and Gene Paul. Recorded at Atlantic Recording Studios and Advantage Sound Studios (New York, NY). Mastered By Stephen Innocenzi at Atlantic Recording Studios. ^ Christgau, Robert (October 1974). "The Christgau Consumer Guide". Creem. Retrieved February 25, 2019. ^ "Finally, the Abandoned Luncheonette from Hall & Oates' point of view". Diner Hotline Weblog. 2013-02-16. Retrieved 2017-02-28. 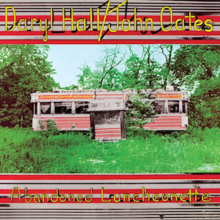 ^ a b c d e f "How Hall and Oates Found Themselves on 'Abandoned Luncheonette'". Ultimate Classic Rock. Retrieved 2017-02-28. ^ a b c d e f "Music and magic by the side of the road – how a young photographer captured Daryl Hall and John Oates' Abandoned Luncheonette". The Huffington Post. Retrieved 2017-02-28. ^ "Abandoned Luncheonette - Daryl Hall & John Oates | Songs, Reviews, Credits | AllMusic". AllMusic. Retrieved 2017-02-28. ^ "RIAA Album Awards". www.hallandoates.de. Retrieved 2017-02-28. ^ "kenilworth, pa - Google Maps". Retrieved 16 April 2015.